My May dress is actually a skirt. I know. But a skirt is actually half a dress so it is ok. Even more: I made two skirts which equals to one dress! I can only show you one skirt because I undid the first one to make the second. 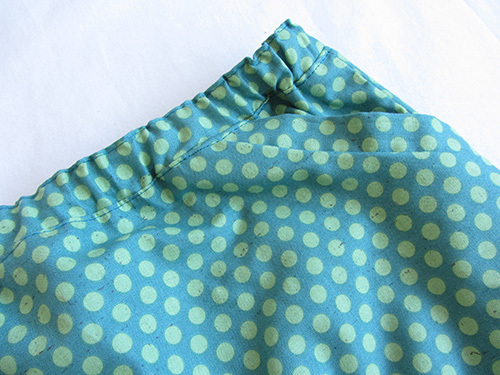 As I was re-organising my fabric stash I came across this lovely spotty fabric and immediately felt the urge to make something with it (it seems that this emerald trend has grown on me). As there was only one meter left, making a dress was not an option. 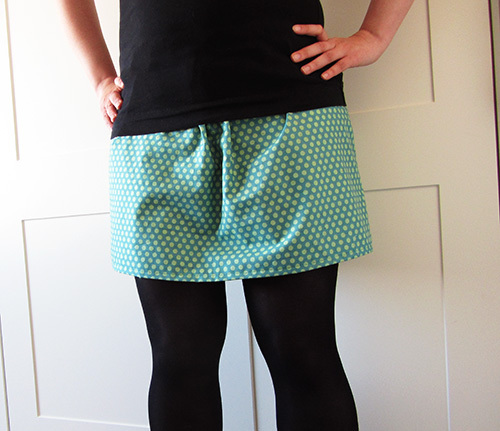 The Milkmaid Skirt by Crafterhours has been on my to do list for ages so it was now or never. This is a lovely pattern and the tutorial is really easy to follow. It starts with taking some measurements, moves on drawing the pattern to size and then explains how to make the actual dress. There is an elastic waistband so no need for a zipper. I love the construction of the pockets, it gives a really nice finish. I added some top stitching on the waist band because I am getting better at this and I love a nice long top stitch in contrasting colour. That is very cute, I love the colour. Thanks, I have to say I have a soft spot for dots too. cute! how long did you make yours? I just finished my first one and wished I had more fabric to work with too. It took me about 2-3 hours I think.